It’s Wednesday, and time for Ask It. Peace on Earth. Goodwill to all. Drinking around the world. Two of these can be found this time of year at Epcot. (Although, truth told, which two you find probably depends who you are traveling with.) One of the most popular events this time of year is Epcot’s Candlelight Processional, a retelling of the Christmas story with a celebrity narrator and full choir. People wait in long lines for a chance to get into one of the multiple shows each evening, but for some people, it is a “one and done” experience or something that doesn’t hold interest to wait to get in. Is the Candlelight Processional something you like to do every year, occasionally, or never? The Candlelight Processional itself lasts about 45 minutes. That doesn’t include waiting in line, sometimes up to 2-3 hours depending on celebrity narrator, if you opt not to do a dining package (where you can wait less time, but have to take the time for a meal that you may not have done otherwise). No matter how you slice it, the Candlelight Processional is a lot of time commitment during a vacation day. Many of the people who said that they go every year also mentioned that they were locals going on an average day instead of a vacation day. For others, the “every year” vote also included people who go every year that they happen to be in the area. It is a family tradition for many people, however, and something that many people wouldn’t want to miss. The “never” votes include both people who have never done it/never desire to do it, or people who have done it once and never would want to do it again, even if other people they were with wanted to see it. The Candlelight Processional is probably one of the most Christian-centric events at Disney outside of Night of Joy. 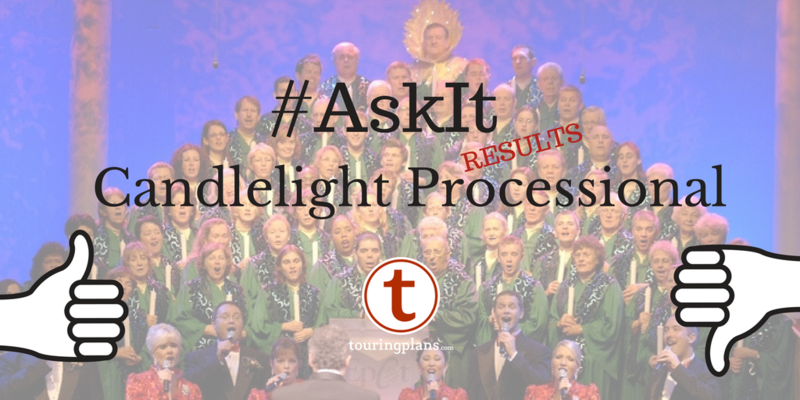 For some people, both Christian and non-Christian, the Candlelight Processional has the vibe of a church service, and that is something that isn’t always part of a vacation experience. For others, even though it is a beautiful show to experience, the time commitment again comes into play. 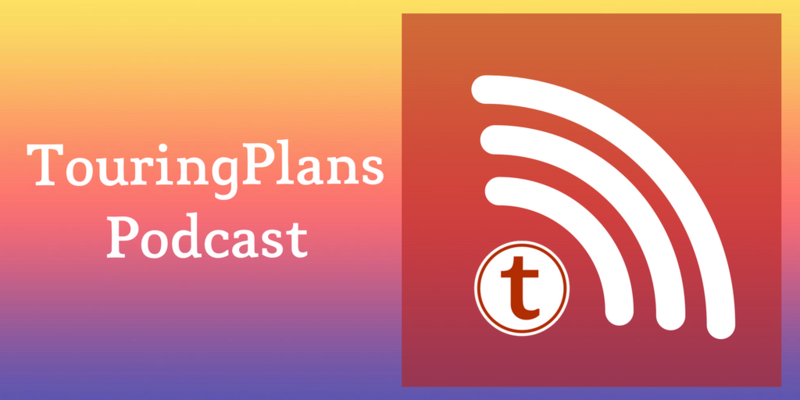 There’s so much holiday stuff to see and do, it’s tough to carve out time for this long show. For less of a time commitment and no line, people can walk right across the way and catch one of the Voices of Liberty performances with similar songs of holiday cheer (and a mix of religious and secular songs). Just edging out the win this week was the occasionally vote. Sometimes when a special event is experienced every year, it loses some of the specialness. For many people, going to the Candlelight Processional occasionally helps keep it a special experience, and something to look forward to when the mood hits to go and see it. Going occasionally also means that it is easier to justify the cost of the dinner package, helping to stave off the lengthy time waiting in line. And although the plot of the Candlelight Processional doesn’t change (it is the Christmas story after all), each narrator is able to bring their own personality to the telling of the story, making it a slightly different show every time. So there you have this week’s results. Next week’s question is live on Twitter and here. In the meantime, do you have any other holiday traditions on a Disney vacation? Let us know in the comments. 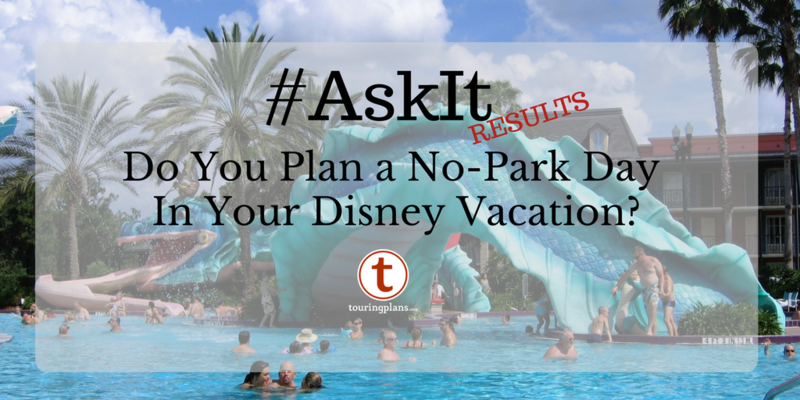 Ask It Results: Do You Plan a No-Park Day in Your Disney Vacation?